A couple years ago, when I was a wee lass taking Intro to Linguistics class in sophomore spring, we had an interesting guest lecture about hearing aids at infancy. When an infant is diagnosed with deafness, and it’s due to problems with parts transferring sound from the eardrum to the cochlea, the parents have the option of choosing cochlear implant for their child. (I believe there is really no option if the nerve to the auditory part of the brain from the cochlea is damaged.) The hearing aid will allow the child to hear sounds, though not at as high a fidelity level as it would have been for normal ear. The child learns to communicate as a person without hearing disability would, but research shows that his or her linguistic development (as measured by reading comprehension and speaking tests) will occur still at a slower rate than a normal child probably because of the low fidelity of the cochlear implants. This is where the argument for sign language comes into play. A child learning sign language as the first language may learn to make best use of the senses s/he has. Assuming that they have received proper training and exposure since infancy to sign language (which is not always the case for a deaf child with parents who are not deaf), they perform on par with children without hearing disability in terms of linguistic development – hence, the debate. Is it better for the child to linguistically perform at 8,90% with hearing aids, or 100% with sign language? The former would be better assimilating to the norm while the latter is better performance. The burden is heavy on the parents. I remember hearing in an early PPAT lecture that as design teams, we should aim to “fail fast”. Fail fast? Psssh. How about fail never? Am I a perfectionist? Perhaps. Am I an introvert? Most definitely. Has PPAT been hard because I’m not an engineer? Nope. This class has been hard because it forces me to share my ideas, including the partially-formed, poorly-articulated, questionably-possible ones. Especially those, actually. 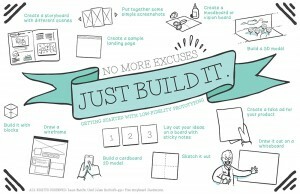 I read this article about low-fidelity prototyping, which rang especially true. The author notes that a desire for perfection in the design process can be paralyzing; the flip side, of course, is wasting resources on design failures that could have been caught earlier. In our project this semester, we’ve certainly felt this tension, and I have often found myself on the side of inaction. The biggest danger of inaction, I’ve learned, is that a project can progress in separate chunks or phases. Additions are not synonymous with iterations, just as a first paragraph does not constitute a rough draft. So how will I resolve this tension, and learn to “fail fast”? I’d like to think of PPAT as the first iteration of myself as a design thinker. I’ve gotten better at thinking with a group through multiple solutions, and when I approach a new project, I’ll be better equipped to hit the ground running. I’ve gotten better at communicating a near-and-dear idea and watching it flop to poor reception. Most importantly, I have learned that progress is only a product of action. Start somewhere. In the U.S., if someone experiences loss of hearing, they simply get a hearing aid. However, in low income countries, that scenario simply isn’t possible. Loss of hearing is a problem that has affected those in developing countries the most. According to a report by the World Health Organization (WHO), 80% of those individuals who have experienced loss of hearing live in low or middle income countries. Yet, the lack of trained personnel and the prohibitive cost of devices make it almost impossible for those living with hearing disabilities to obtain and use these devices. As a result, less than 10% of the people who need hearing aids in these countries can obtain them. Physician looking into the ear of a child who is suffering from hearing loss. Here, technology transfer, the act of transferring knowledge about some type of technology from places where the product market is saturated to places where need is still unmet, has been the model for addressing this problem. Based on recommendations from WHO, scientists aimed to build a target product that cost about $50 (the current price of hearing aids in the U.S. market is in the thousands of $), using ear molds that could be molded on the spot (so that the patient would not have to visit the clinic twice), and a rechargeable solar powered battery (to eliminate the need of costly batteries that need to be replaced weekly). Solar Ear hearing aids made and used in Brazil. The end result was a product known as the Solar Ear, created by a Canadian entrepreneur Howard Weinstein. Solar Ear does not require an ear mold and eliminates the need for replaceable batteries due to its alternative source of energy. Yet, the technology itself is not a panacea for the disability gap that occurs in developing countries, for the lack of skilled healthcare workers to implant these devices may create a bottleneck in hearing aid distribution. Thus, the technology transfer of Solar Ear over to developing countries requires, not only knowledge of the product, but also a concerted effort to improve the healthcare system in these countries. These policy changes may be complex but are essential for making these devices accessible. For the technology is only half the story. 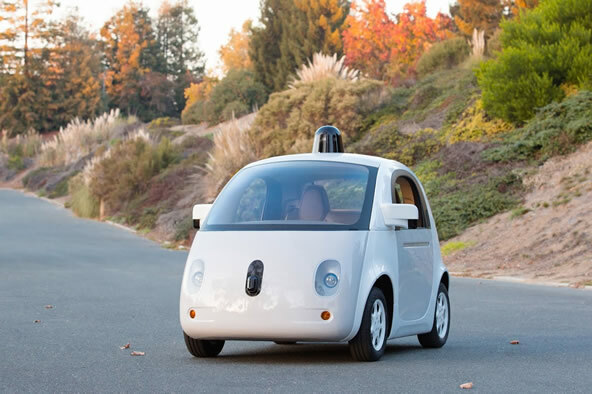 Self-driving cars are an exciting advent for everyone, but they have particularly interesting implications for people with disabilities. The disabled community can make use of driverless cars to gain independence in transportation that they currently may not have. Right now, many people with disabilities are not legally allowed to obtain a driver’s license because of their limitations. For example, those who are visually impaired, hard of hearing, or have limited motor control of their arms and legs are unable to drive motor vehicles. People with cognitive and emotional disabilities are often not permitted to drive, either, because of the information processing and quick judgment calls required by the activity. As a result, the disabled community frequently finds itself dependent on others to drive them. Some use public transportation on their own, such as my client Kurt, but navigating transportation systems independently can be an intimidating task for many. Relying on others for transportation is a large contributing factor to the lack of independence that people with disabilities experience and often feel frustrated by. Driverless cars have the potential to offer a solution to this challenge. Without the need for human intervention, these cars could be used by everyone, including those with disabilities, for independent transportation and navigation. The National Council on Disability (NCD) recently released a report that sheds light on this point. The NCD is urging developers to design driverless cars with the disabled community in mind, so that the technology is accessible for all. The report highlights the idea of universal design, in order to prevent one sector of the community from falling behind in technological advancements. Possible issues that could arise include the need for emergency human intervention in case of a system failure. For these scenarios, there should be a variety of means to alert the person about the situation, such as audio, visual, and tactile. There would also need to be multiple methods to take control of the vehicle or evacuate from it. These pose tricky problems that may limit the extent to which disabled people can use driverless cars. Nonetheless, if these challenges are addressed during the development phase, self-driving cars could be a very exciting example of an innovation that benefits everyone, and especially improves the lifestyle of people with disabilities. It’s a dark Tuesday night and our team has yet again mustered up the strength to meet despite the weight of school that rests on our shoulders. As I reflect on our team meeting, I have come to recognize how powerful it is when colleagues of different professions come together for one purpose. Regardless of events that may have taken place during the day, all of our concerns, worries, and burdens is left at the door the moment we gather to discuss the progress of our “Voice Read” web extension. Over the past couple of months, our team caught a lot of momentum as we saw our web extension “Voice Read”come to life. We started as group communicating via email and struggling to find the best times to meet. But here we are now, nearing the end of our project and in the final stages of perfecting our product. In addition to tweaking and finalizing Voice Reader, two team members have been administering 2 reading assessments – one without using Voice Reader and the next with Voice Reader. I found it interesting that, while I expected to see drastic change between the two scores, her test scores do not reflect improvement when using Voice Reader. In our OT curriculum, our professors remind us that standardized scores do not provide clinicians the “full picture” of the person. Yet often times, without these scores many will question the validity of a information that is provided. I, too, generally question reports that only provide qualitative/subjective data. There is too high of a risk for responses of self-report/interviews to be skewed or biased. However, this experience, working on Voice Read, has really challenged my preconception towards the validity of subjective data. Our client’s score indicates that Voice Read is not an effective tool in promoting her comprehension or readability. Yet, during team meetings Stacy has shown great excitement and satisfaction with the continual improvement that has been made to ensure that Voice Read fits her needs. Take away message: There needs to be greater focus on ensuring that the assessment is accurately measuring the outcome of interest. Moreover, just as gold is equally valued as to diamonds –> qualitative data should also be as equally valued as quantitative data. The hierarchy for assistive technology selection begins with adapting the activity to the user. If adapting the activity is not feasible or sufficient, then the next step is to consider using a commercial device that is available to everyone. Not only is adapting a commercial device often cheaper and less effort, but it also reduces the stigma of using an assistive technology because everyone uses that commercial device. 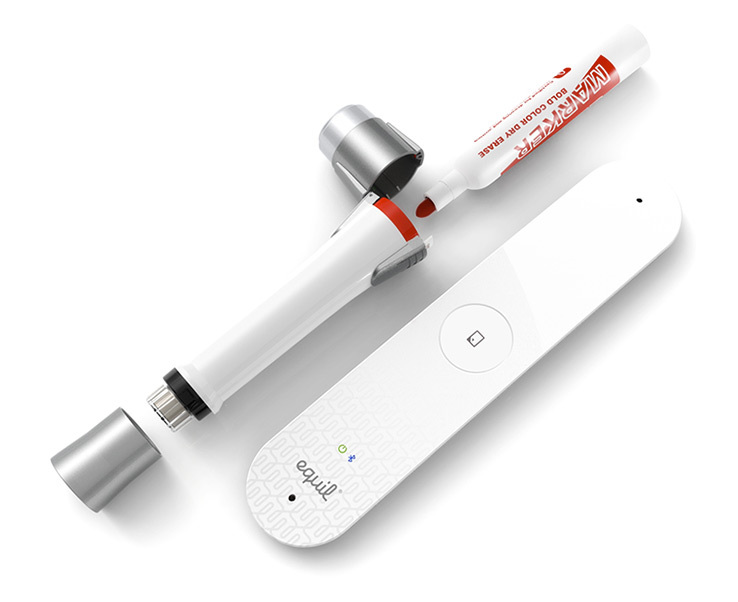 The Equil Smartmarker is a commercial device that captures, shares, and streams live notes written on any whiteboard surface, making it perfect for the classroom. Students with low vision or other learning disabilities often require classroom notes to be provided to them. However, with the Equil Smartmarker, teachers can easily live stream their written notes onto students’ iPhones and Android smartphones. Students with visual impairments can follow along with the live stream on a large personal tablet or computer monitor. Equil Smartmarker also stores up to 1000 screens, which can be downloaded onto a device at a later time. Teachers can save entire white boarding sessions and email them to students for future reference. The design of Equil Smartmarker makes it easy to incorporate into the classroom setting. Teachers can use their preferred whiteboard markers, and the casing allows for quick and easy marker replacement. A major consideration for selecting assistive technology for use in the classroom is ease of implementation. Not only can the Equil Smartmarker be implemented seamlessly into the classroom, but it also has the potential to improve the learning experience for all students. Therefore, teachers are more likely to invest the time and energy into using it. Currently, the only drawback to this product is the price: Equil Smartmarker is on the market for about $650, which is a bit pricier than the average budget for whiteboard supplies. Last week, the three mechanical engineer students created and trialed the 2nd prototype of the dogcart. With our client’s approval, they designed a dogcart similar to the Playmarket Go 3 Shopping Trolley Cart, a cart that she currently uses for grocery shopping and daily use. For daily use, she said that she carries a lot of books if going to/from the library, a tablet/kindle, food and drink for her and Orenda, her dog, a mat for Orenda, and items that she purchases during the day. After trialing the 2nd prototype, she said that this cart is a good size for daily use and a little small for groceries, but she said that she is willing to make extra trips if necessary. She suggested that we add attachable storage to create more room. It took approximately 1 minute to put the harness on Orenda and 20-30 seconds to attach the cart to the harness. The setup time could vary depending on the dog’s level of excitement. 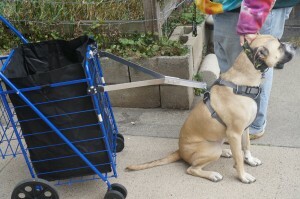 From our 1st prototype, we shortened the length from the cart to the harness. For the 2nd prototype, our client’s biggest concern is the tires and their potential for wear as well as their ability to transverse the necessary terrain (e.g. sidewalks and streets). It is a top priority for our client that the cart is all-terrain. Because changing tires will be necessary after long-term use, the next prototype should consider simplifying wheel replacement process so that our client is able to do this successfully and independently. We have yet to test the maneuverability of the cart when it is attached to Orenda because of her level of excitement. Since our 1st blog post, we have learned a lot about our client that may influence our design of the dogcart. We learned more in depth about the impact of her osteopetrosis, which causes her bones to become dense. She reported that her secondary diagnoses are arthritis, tendonitis, and carpal tunnel of her hands. 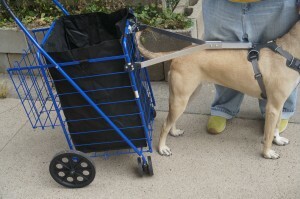 Her conditions impact her ability to hold onto the dogcart handle and hold onto the dog leash. Thus, it is important that we add a handle that is ergonomically friendly to decrease our client’s discomfort and pain. 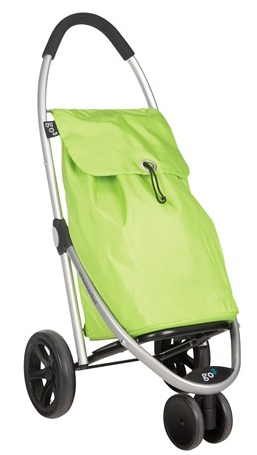 It is also important to consider our client’s ability to independently put the harness on Orenda as well as to independently clip on/off the cart to the harness. Because her condition impacts motor functioning of her hands, it is important to observe our client attach/detach the dogcart to make sure that she can do so independently and ergonomically. Also, it is concerning that our client reports having difficulty holding onto the dog leash, especially because Orenda is in the process of getting trained. During the last meeting with our client, Orenda was very excited and couldn’t stand still. At one point, she even rotated almost completely while still attached to the cart. In addition, the next prototype should consider redesigning the clamps so that the dogcart can fold and be placed inside our client’s home to extend its lifetime. Future testing is required for maneuvering the cart on the T or bus and when it is attached to Orenda with heavier loads. We are thinking of go grocery shopping with our client and Orenda attached to the cart to further test durability and maneuverability of the dogcart. SightCompass was founded less than four years ago with the ambition of using technology to bring accessibility to people with vision loss or significant vision impairment. Today, the company has expanded its reach and is developing assistive technologies for people who have a range of disabilities. Using a Bluetooth 4.0 enabled smartphone with the free SightCompass app, SightCompass Beacon broadcasts details about the user’s environment (Figure 1). Completely wireless, no pairing or needing access to private networks. When the user opens the app and SightCompass Beacons are located, information about the user’s surrounding is transmitted via audio to the user. Essentially, details of the environment are read aloud to the user. The information can include just about anything you can imagine: a detailed description of any room, including objects such as menus, tables, location of drinking fountains, restrooms or smaller objects such as power outlet locations or button descriptions on a vending machine. The accessible information that SightCompass offers is nearly endless and applications are vast. SightCompass is an ideal product for those with vision impairments but it’s also helpful to those who have learning challenges and anxiety disorders. Figure 1: The SightCompass online Dashboard, Beacon and free App trio. Dashboard allows information updates. Now, with this tool available, what will you make accessible today? The most visible assistive technologies are those that assist physical disabilities: wheelchairs, prostheses, head pointers. But what about assistive technologies for something less visible, like anxiety disorders? Approximately 40 million Americans above the age of 18, or 18% of the adult population, is estimated to have an anxiety disorder. Among youth, that number is even higher. And at a place like MIT, anxiety is especially prevalent; I personally have many friends who have struggled with anxiety. Ironically, the stress itself often causes people to be reluctant to seek out help with dealing with anxiety. Anxiety may not typically be viewed as a disability. 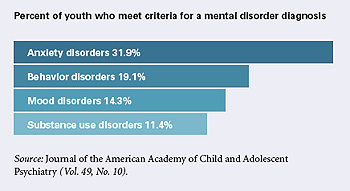 But in its impact on mental health and physical health, it can become a significant impairment. In the unrelentingly optimistic environment of Silicon Valley, several start-ups have arisen to tackle the problem of assisting people with anxiety. One such start-up is Joyable, founded by Pete Shalek and Steve Marks, which just raised its seed round of $2.1 million this past March. Joyable is targeting in particular Americans who suffer from severe social anxiety, of which an estimated 15 million exist today. According to Joyable, a clinical treatment for social anxiety known as Cognitive Behavioral Therapy has already been proven to be effective. The question then becomes how to use technology to make this therapy more widely and cheaply accessible than traditional expensive in-person therapy sessions. Joyable currently uses an approach composed of three methods. The first is educational, teaching users what are the causes of their anxiety. The second is based on combating negative thoughts. The third involves completing tasks of increasing difficulty, from placing a phone call to meeting up with a friend. In addition, Joyable connects users with a coach, with which they can communicate online or through phone calls. I think this problem space is particularly interesting. The high barrier to entry of seeking out therapy is often discouraging, perhaps especially so to people with social anxiety who may be resistant to even place a phone call. On the other hand, with the omnipresence of computers and mobile phones comes the largely underutilized power of constant monitoring and reminders, which traditional therapy cannot accomplish. My vision is that everyone will have access to an on-demand, online mental health care system that works symbiotically with the traditional in-person mental health care system. I recently started working with the MIT Global Engineering and Research (GEAR) laboratory as an undergraduate researcher. The project I’m working on is developing a low-pressure drip irrigation system that you can read more about on their site. GEAR also does research on different assistive technologies, focusing on designing products for the developing world. The Principal Investigator for GEAR, Professor Amos Winter, came and talked to PPAT about the work his group has done, including the Leveraged Freedom Chair (LFC). The LFC is a lever-driven wheelchair, giving the user much better mechanical advantage for navigating through rough, rural terrain. The lever design also allows users to adjust for different terrains by moving their hands up and down the lever, requiring significantly less work than a normal wheelchair. In large part, what makes the LFC unique is the process in which it was developed. The LFC was designed with the user first in mind. The wheelchair had to be affordable for the target users. It also had to be rugged, durable over long distances, and easily repaired locally. After user testing, GEAR found out that the levers needed to be removable for indoor use. If you want to hear more about how the LFC was developed, you should watch this TEDx video from Amos Winter. Now, the LFC design is being adapted for wealthier market users in the United States. The US model is being made out of higher-end materials, and it has additional features. You can read more about the new model at their site (www.gogrit.us). GEAR develops for the developing world first and then adapts that technology for the wealthier consumer market, rather than the other way around. This approach makes the GEAR lab unique, and assistive technology users worldwide would benefit from more groups taking this approach.